I am running postwar and modern Lionel with a ZW. I inserted a 6 amp automotive circuit breaker in series between the ZW and my 5906 's. It seemed to help prevent the heat and burn up of the buttons from derailment shorts, but recently I had one button still get a little hot and it now appears to be restricting voltage to the track loop. 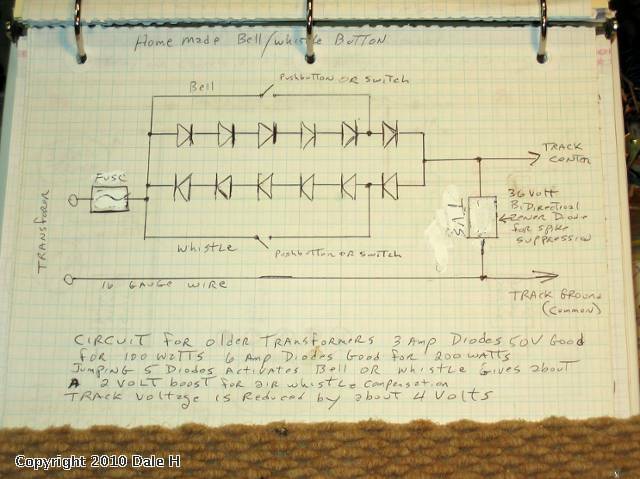 I am thinking that the answer lies in your schematic home made whistle bell button: I want to replace my bad 6906 and add a TVS to prevent spiking. I do not know much about electronics. I am not ready to build my own sound buttons, but want to protect the 5906's for use with my ZW & new and old engines. Is the "36 volt Bi-directional Zener diode" the correct application for my ZW (on each circuit) to protect the buttons and the on-board sound? (or should I be looking at the notes at that bottom of your sketch for a larger TVS to go with the ZW. Are their other specs I need to know before purchasing the TVS diode? Where do you recommend purchasing them from? Am I on the right track, or totally derailed in my thinking? Here is a post with more detail on the bell/whistle controller. You may have to copy and paste as this site does not enable direct links. The bell whistle controller can be left in the circuit or out,depending on needs. If left in they do get hot but the diodes should handle a reasonable amount of track amperage. My automatic whistle controller is nothing more than a d cell battery in series with power to a track block. When the train travels through that block the whistle blows. Track block can be any length necessary. Switches can add or remove the battery as wanted. Be sure to add the appropriate whistle post by the side of the track.